In which I use advanced analytics and complicated modeling to support the provocative notion that Lebron James is good at basketball. In this previous post, I laid out an approach for defining clutch play in the NBA, using my win probability model to "score" the impact of each play in a game. A clutch situation is a time of heightened sensitivity, where good plays are rewarded more, and mistakes punished more severely. My current definition of clutch play is rather broad, including all plays whose impact exceeds the median value (e.g. a three pointer typically adds 4% in win probability, so a three pointer with a win probability added of 4.5% would be considered clutch). For this post, I will use a more restrictive definition of clutch situations, one that hopefully is more in line with general understanding. Instead of taking all plays above the typical value, I will only count plays that are above the 75th percentile. The chart below summarizes effective field goal percentage (eFG%) by player for clutch situations (using the 75th percentile definition above). I am counting the top 25 players in terms of field goal attempts in clutch situations (ranging from 98 attempts for Russell Westbrook and 37 attempts for George Hill). In the clutch, Lebron has shot a torrid (blistering? scorching?) 72.6% on 42 attempts. At the other end, we have John Wall, who managed just 32.6% on his 43 clutch situation attempts. Here's another way of looking at the data. We can also see how a player's shooting performance in clutch situations compares to their performance in non-clutch situations. Who is rising to the challenge when it matters most? In the chart below, I have added a player's non-clutch eFG%. 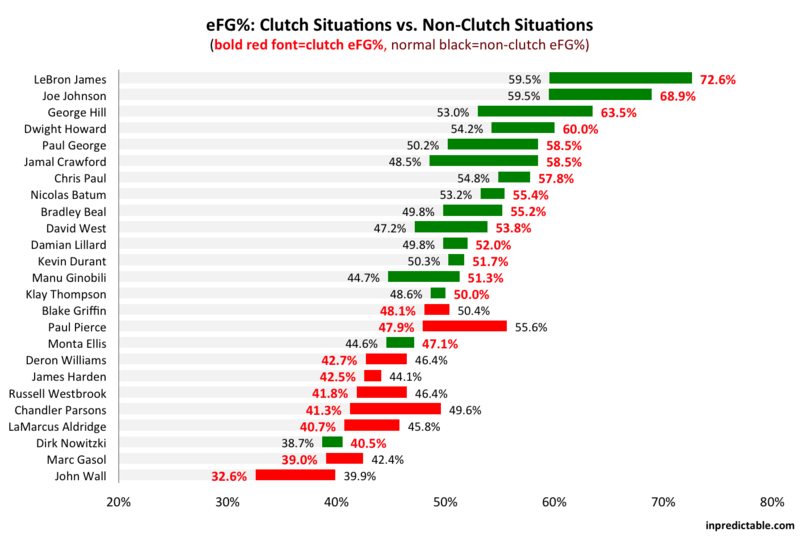 The bold red font indicates eFG% in the clutch, the standard font the player's non-clutch eFG%. The bar indicates the gap between a players clutch and non-clutch performance, where a green bar signifies better clutch performance, and a red bar the opposite. 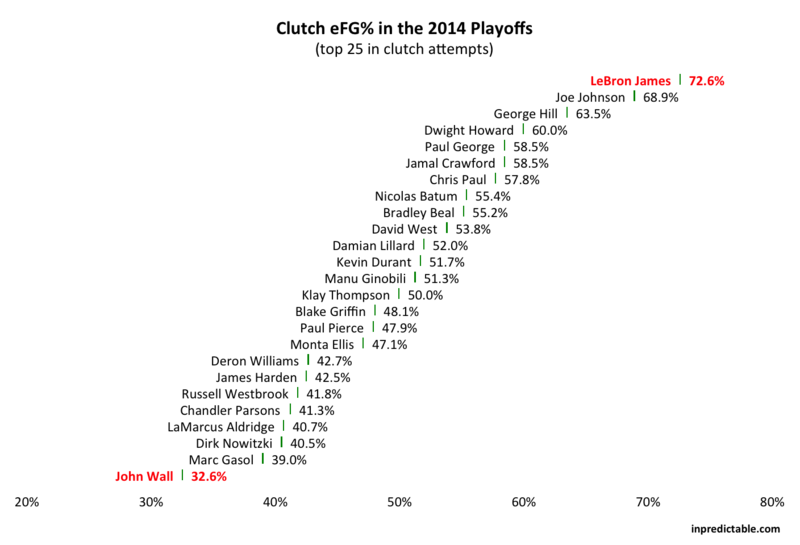 Lebron also has the largest positive gap between clutch and non-clutch (13% higher eFG% in the clutch). Next closest is Jamal Crawford, with a +10% differential. At the other end of the spectrum, we have John Wall, Chandler Parsons, and Paul Pierce, whose eFG% dropped ~8% in clutch situations.